The global selenium sulfide market is highly competitive and consolidated in nature, owing to the presence of a few players who are holding a key share of the global market, states a new research report by Transparency Market Research. In 2015, the leading players operating in the selenium sulfide market across the globe, namely Abcr GmbH, Wockhardt, Alfa Aesar, and Fagron collectively accounted for more than 60% of the global market and is likely to remain in the dominant positions throughout the forecast period. These players are expected to focus on untapped markets in Asia Pacific and the Middle East and Africa in order to expand their market presence and gain a competitive edge in the global selenium sulfide market in the coming years. Moreover, the increasing focus on mergers and acquisitions is likely to contribute towards the overall development of the market in the next few years. As per the research study by Transparency Market Research, in 2015, the global market for selenium sulfide was worth US$27.5 mn and is likely to reach a value of US$35.6 mn by the end of 2024. The market is expected to register a 2.90% CAGR between 2016 and 2024. From a geographical point of view, Asia Pacific is likely to lead the global selenium sulfide market throughout the forecast period. The growing demand for cosmetics and other personal care products is anticipated to accelerate the growth of this region in the coming years. In addition, the rising disposable income of consumers and the tremendously rising population are anticipated to supplement the Asia Pacific market’s growth in the near future. A substantial contribution from China, Singapore, Thailand, and India is estimated to create promising opportunities for key players in the market. Furthermore, Latin America is expected to witness healthy growth in the coming years. On the basis of applications, the global market for selenium sulfide has been classified into veterinary medicine and personal care. Among these two, the personal care segment is estimated to register a remarkable growth throughout the forecast period. The rising demand for various personal care products and the enhancement of the distribution network across the globe are projected to accelerate the growth of this segment in the near future. On the other hand, the segment for veterinary medicine is estimated to witness a steady growth in the coming years, owing to the lack of awareness regarding consumers across the globe. The tremendous rise in the demand for personal care products is one of the key factors anticipated to encourage the growth of the global selenium sulfide market in the forecast period. The key players in the market are emphasizing on advertising and marketing tactics in order to promote personal care products is likely to accelerate the growth of the market. In addition, the rising awareness among consumers regarding the benefits of using veterinary medicines in several developing nations is anticipated to supplement the development of the overall market throughout the forecast period. On the flip side, the global market for selenium sulfide is predicted to face several challenges in the next few years. The rising concerns related to the carcinogenic properties by selenium sulfide has resulted in several restriction related to its rise in personal care products. This is projected to restrict the growth of the global selenium sulfide market in the coming years. 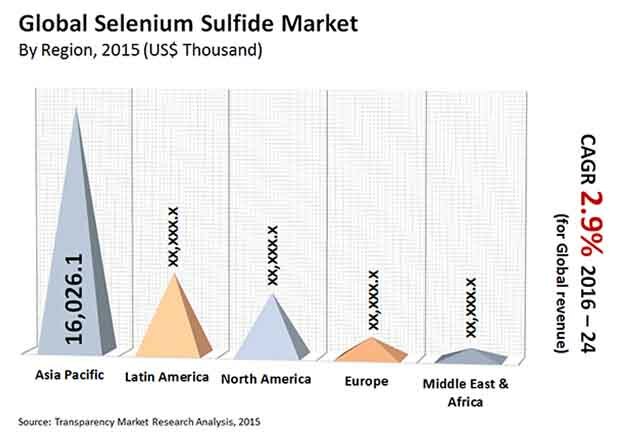 Nonetheless, the expansion of the application base and the introduction of new products are predicted to fuel the growth of the global selenium sulfide market in the next few years.